Milk prices have certainly gotten higher in the last few years, high enough that many of us small farmers are seriously considering a dairy animal. For our family, the sheer volume from a cow, plus the added expense for purchase and maintenance, was a serious roadblock to obtaining one. We never even considered a dairy goat, because, well, we never drank any goat milk. There definitely is a stigma against the dairy goat, and we often associate them with a “goaty” taste and unpleasant smell. While bucks do have a very unpleasant odor in breeding season, the females, or does, do not and are pleasant and easy to care for. When milk is $4.50 per gallon at the supermarket, keeping a dairy animal starts to look really economical, especially when you drink a lot of milk. For us, with 5 children, we will use 1-1.5 gallons of milk each day. At today’s prices in our area, that adds up to about $130.00-$135.00 a month. We were resigned to high milk prices, as we didn’t know anyone to trade milk with, and we couldn’t afford a cow. We also did not have proper shelter for a cow, nor anywhere suitable for milking. Many families like us, are spending quite a lot of milk each month, just because of these problems with owning a cow. We met a local family through our church, and imagine our surprise when they had a dairy goat. We actually kept their goat for them while they went on vacation, and she was so terrible in temperament and attitude, that, although we thought we might enjoy the milk, we couldn’t stand the thought of owning and caring for such an obnoxious animal. We didn’t know the number one rule of goats! One goat wants out, but two goats want out less. To say the least, our sheep tight fencing was not acceptable for a goat. Since the goat was alone, without a buddy, she was cranky, mean, and always trying to escape. When her owner came back from vacation, we shipped her off and said “GOOD RIDDANCE!” However, the idea of the goat stuck with us and after a long enough time, I found myself reading up on dairy goats, despite my unpleasant encounter with that particular goat. With lots of reading and research I found out about that number one rule of goats, and according to the books and websites, most dairy goats are entirely different than that goat. They are known to be gentle, friendly and are reputed to be excellent children’s companions and pets. We found some milk, tried it, and found it to taste wonderfully sweet and good. It has a milk flavor, with a nice creamy texture, very much like that from a Jersey cow. It is rich and creamy, and does not taste “goaty” at all. Some breeds can have a stronger flavor, namely the Toggenburg which was bred for cheese-making. The milk we drank was delicious and we all liked it. So we found ourselves looking for a breeder from which to purchase a couple of goats. From the reading, there were a few criteria that I wanted to meet, without exception. First of all, we had a price to find, one we could afford, and some of the dairy goats are very expensive show-type animals. We also wanted a goat that had been dis-budded, and therefore would have no horns. We knew for SURE we wanted two goats and not one. Since we had never milked before, we also wanted a seasoned milker that was very easy to milk. We needed an older goat that could teach us what to do. Since it was also for a 4H project, the goat needed to be of good quality as well so that it, or its kids could be shown for the fair. With the low price we needed to find, it was not looking very good for us getting any goats, but luck was with us, and we found two. Often the good breeders will have a doe or two, that is perhaps a little older, has a limp from injury, or some other defect. These can often be purchased for a very reasonable price, and they met all our other criteria as well. One had a bum leg, and the other was just very small and therefore not show-material. We bought these goats, and after a hard and fast learning curve on goat care, we have become successful goat herds. We milk the goats, and they save us about $75 or more each month with their milk. We can always find someone who is happy to take extra milk, and often make cheese and soap. Best of all, they were both bred to show-quality sires, and both of them were of show-quality breeding, just not show-quality themselves due to environmental factors. We ended up with three beautiful kids for the fair, and plenty of milk to drink. The story has a happy ending, with the family having lots of milk, ice cream, cheese, sour cream, buttermilk, and other dairy products to eat and enjoy. We can sell (or make for ourselves) wonderful soaps, as well drinking our goats’ milk. The does are personable, pleasant and easy to handle. The children play with them, and they are ideal pets and companions, even for very small children. The lack of horns and pleasant disposition of these two animals have completely erased our negative impression of these now well-loved individuals. So, looking back I think that a person considering a dairy animal is very well served to consider a dairy goat. They do require some special care and also have some needs that must be met for optimum output. A very happy goat is wonderful, and a very unhappy goat is horrid. Compared to a cow, a good dairy goat is much cheaper, with a pair of does costing about $200 – $500 for a good pair. A cow would cost at least twice as much, and often more. The price of the cow notwithstanding, they also have a much higher maintenance cost, as well as a higher breeding fee. A dairy goat is so much more economical and gives you so many benefits that every small farm should look closely at the possibility of keeping some dairy goats. 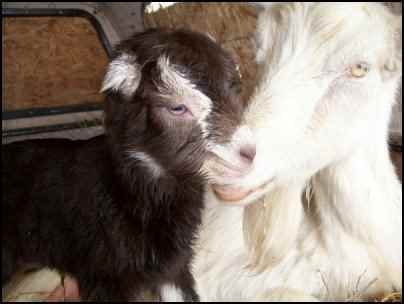 Goats are small and can be easily transported in regular vehicles. You can put them in the backs of trucks with camper shells for example, or even in the back of a van or station wagon. If you are careful to protect the surfaces from soiling, then a goat will happily go, even in the back seat of a regular car. 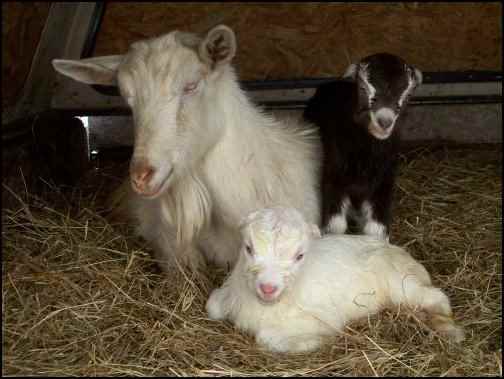 Goats are easy to transport and take to the vet, or to be bred. A cow, on the other hand, requires a trailer, and a big vehicle to tow it. Transporting a goat is much easier than a cow if you do not already own a trailer and truck or towing vehicle. Goats also have a much lower feed cost in comparison to a cow. One cow will eat as much as 3 to 6 goats, depending on the breed and needs of the individual goat. Pygmy goats are the miniature milkers of the goat world, and they are extremely economical to keep, and yet put out plenty of milk for the average family. Even larger breed goats will only need about 7 pounds of hay a day, whereas a cow can need as much as 25 or more pounds each day just to maintain her condition. Add lactation needs on top of that, and the savings on milk are gone into the expense of hay unless you have the equipment to cut your own. Goats will happily eat “weedy” hay that cows and horses will not, so hay is often very cheap and perfect for goats as long as it is not moldy. Grain, mineral and other expenses also come into play, and the goats win every time with a lower cost of upkeep. Two goats are much cheaper to raise and keep than even one cow, and with two goats, you can keep one fresh almost all year. Goats are also easier on the land and graze very well with other livestock such as cattle or horses. Because they prefer browse, or bushes, instead of grass, you can use your goats to keep brush down, and fence rows clean. They will go along behind horses or cows and eat down what was left behind, cleaning up brush and weeds. Provided they are getting good mineral and grain, they will still fill your pail with wholesome and delicious milk, all the while helping to keep the place looking great and the pasture nice. They do not share worms with cattle or horses and they get along well with both. 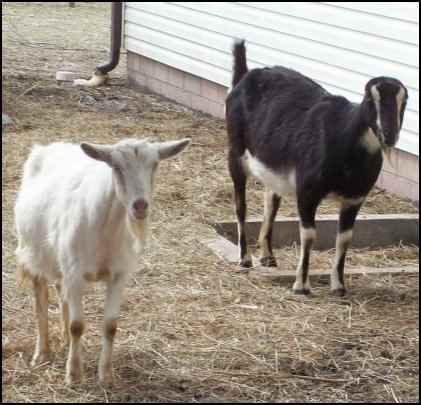 Goats can keep a wooded area completely clean and park-like in suitable numbers, without a chainsaw or rake in sight. Fence rows are clean and brush free, with no brambles or thorny bushes to clear away for repairs. Goats have a real positive effect on the appearance of their home and can save their owners much back-breaking labor. They are easy on the land and will prefer to eat food that is left behind by other livestock. 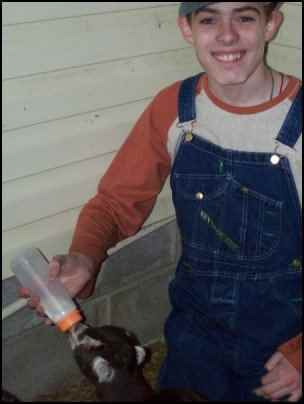 Shots, medicine, and general care of the goats are also easier and especially better if you plan on having children to help with milking and caring for the animals. 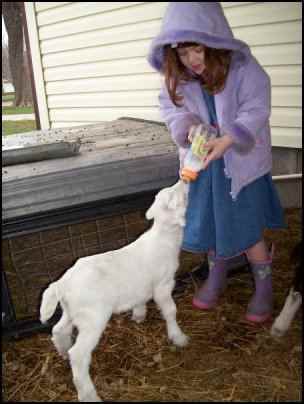 Keeping dairy goats is a great way for children as young as 4 or 5 to contribute and produce a product for the family to consume. Children get a big benefit from learning how to care for an animal and they also get a good sense of accomplishment from being in charge of providing milk for the whole family. Goats are generally much easier to milk, as they have a softer udder and their small size and wonderful disposition make it easy for a child of 7 or 8 to learn to milk the goat. Younger children can help bottle feed the babies, put out hay or help with other parts of the goats’ upkeep. Children can also learn how to make money with an agricultural project as they care for the goats, which makes them perfect for 4H or FFA. The will be able to sell the milk to Mom, and also market the kids that are produced from the breeding of the does. Children can really benefit from the responsibility of raising and caring for a pair of dairy goats and their kids. Dairy goats are also easier to keep as they do not have the need for a large barn like a cow does. A simple shelter that is draft free in winter and dry will suffice. It can be as simple as a small shed, and the goats will thrive and be happy. Each goat needs about 25 square feet of space to move about, and they will do well if they have a place to walk and exercise that is protected from the weather as they do not like to get very wet. If your shed doesn’t have a floor, then you can put down pallets and bed them deeply with straw with great success. They also do not require a large area for milking, you can easily bring them into the garage, on the porch or another small area for milking and have no problems what so ever. A goat will not soil the milk stand under normal circumstances so waste and urine are not an issue to clean up if the goat is brought inside a garage to milk. A simple milk stand is easy to build and very low in cost. The goat stands on the stand to be milked then is whisked away back to its pen afterward, with hardly any mess to clean up. So a small part of a garage, shop or even a porch is just fine for milking a goat. Goats have a very minimal requirement for shelter and milking facilities which again makes them a smart choice for the small farm. Goats are obviously more economical than a cow, but what about the milk? Goat milk is also more healthy, easy to digest and tastes wonderful if the goat is well treated, healthy and kept properly. You must keep bucks away from the does at all times except during breeding season, at which time the does are dry. Exposure to bucks can cause the milk to taste goaty and disgusting. You will also need to handle your milk in a sanitary way. Any bacteria, or unsanitary conditions, can also cause your milk to taste bad. You can drink the milk raw, or you can pasteurize it. It will keep longer if it is pasteurized and you will not need to worry about problems with bacteria. Once you are familiar with milking, then you can drink your milk raw if you choose. You will also need to make sure that the goat has a proper diet, good minerals and watch out for mastitis and other illnesses that are related to dairy animals. There are tests available, and lots of resources and after a bit of learning, the new goat owner will soon feel confident and be able to care for their goats, and maintain good milk production with ease. The milk is not only healthier, but it tastes sweet and delicious with a wonderful creamy texture that is great for many dairy products. Goat milk is also excellent for soap making, with many of the handmade goat milk soaps selling for impressive prices at farmers markets and festivals. A person keeping goats can easily begin to learn to make soaps, and there is a real potential for a side income from a mail order or booth type business. The soaps can contain natural botanicals, be organic, and contain oils and fragrances that are beneficial and healthy, which makes it perfect for the niche markets. The soaps are rich in conditioners, and once you use one, you will want more. Getting started doesn’t have to cost too much, and you can grow and add to your soap making business as you make profits. The money you save with the goats, could, in fact, start a business that had good potential to supplement your farm and household income. There are many dairy products that are very good made with goats milk and you can learn to make many of these at home with your own high-quality milk. Yogurt, soft cheese, pressed cheese and cultured products like buttermilk become economical and easy to come by, as you can easily make them for yourself with surplus milk. Ice cream and other treats such as homemade pudding become even better made with fresh goats’ milk. Gravy, cream sauces, and other milk-based foods are also improved with goat milk because of the creamy texture, and light flavor of the milk. Goat milk is not only wonderful for drinking, but also for making cheeses and cooking as well. The rich flavor and creamy texture makes a lower fat alternative to cream but has a comparable texture and flavor. Goats are fun, personable, and pleasant animals that require very little in the way of fancy housing, fancy food, and fancy surroundings. They need lots of love, a good buddy, proper diet and good fencing to be healthy, happy and productive. They will eat on weeds and brush, and as long as they are supplemented properly still give you over a gallon of milk in the pail a day. You can clear your brush out, and feed the family at the same time. You can make your own cheese and dairy products, which will save a ton of cash in the long run. You can even make your own soap and market this for resale if you want. You can get all of this, and save money with a pair of good dairy goats. The dairy goat is truly the small farmer’s dream come true.